When I started out as a painter I was at tiny Oberlin College in Ohio. All the art students there worked abstractly so I followed suit. But in their art library I stumbled across the work of Edward Hopper, so different than the simple geometric abstractions I was doing in painting class. Something about Hopper's bright lights and long shadows struck a deep chord in me and I realized I had to change direction and head off into realist painting. Funny thing happened. 15 years later I had a solo show on Cape Cod at a small art gallery. At that time one could clearly see the influence of Hopper's work in my paintings. The family that owned Hopper's studio bought a couple paintings and invited me to come visit them in the studio Hopper lived in for 30 years in S. Truro on the Cape. One thing led to another and I ended up staying and working in Hopper's old studio every other year since 1983. 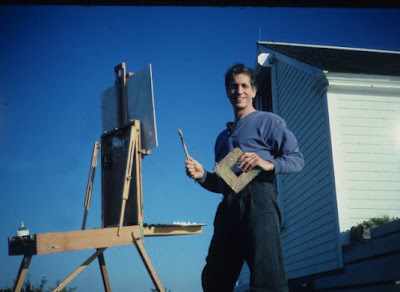 At the top is a photo of me painting outside Hopper's studio along about '95. In back of me is the 10' tall north facing studio window Hopper put in to flood his painting room with natural light. Below is an oil painting of my wife Alice done from life in the studio. She stands at the door leading out to Cape Cod Bay. Hopper and his wife Jo no doubt spent a lot of time gazing out at the water just like this. Hopper was never a teacher face to face with young artists. But the power of his example and the inventive yet subtle qualities of his work spoke loudly to me back in Oberlin College's Art Library back in the late '60's. 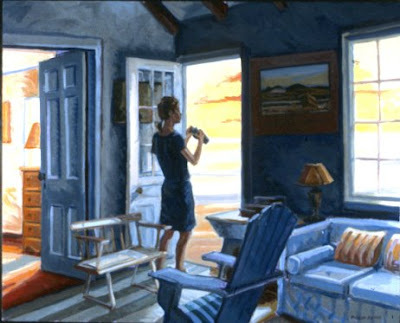 And when asked which teachers I studied with as a young artist, I always want to answer "Edward Hopper."